Today I was about to make a new version of my ExTiX Build from 161203. I quickly learned that it isn’t necessary. It turns out that full support for the Intel Compute Stick is included in all kernels from version 4.11 until today’s releases (4.18). Kernel 4.8.0-26-exton-IntelAtom (which was used in my build from 161203) was patched – see below. Without patches it wouldn’t have worked. Today any Linux system can run on the stick. At least all Ubuntu versions from which I have experience. This means (of course) that all ExTiX flavors can run on the stick. The only thing to think about is that the Grub boot line has to be somewhat special – see below. Those of you who have installed ExTiX Build 161203 can just upgrade the system from 16.10 to 18.04.1 LTS and then install a new kernel. For example “my” Ubuntu kernel 4.18.12-exton. Open /etc/apt/sources.list with Leafpad and replace all instances of yakkety with bionic. Then run the command sudo apt update. After that you can upgrade the whole system using Synaptic. I have done it myself so I know it works. Build 161119 – my first for the Intel Compute Stick – has been replaced by Build 161203. Some errors in the first build have been corrected. Occasionally crashes of Ubiquity when running the previous version of ExTiX (from161119) was the main reason for the new release. I.e. in Build 161203 Ubiquity (and everything else) will work as expected. You can run ExTiX live as root (superuser) or as the ordinary user extix. Log in from LXDM Login Manager as root with password root or as extix with no password. During a “hard drive” (SD card) installation you will get the opportunity to create your own normal user. When logged in as extix you can use Sudo to become root. (Command: sudo su). 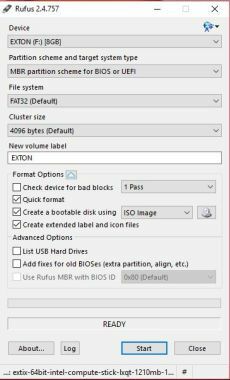 That is best done in Windows using Rufus – Create bootable USB drives the easy way. 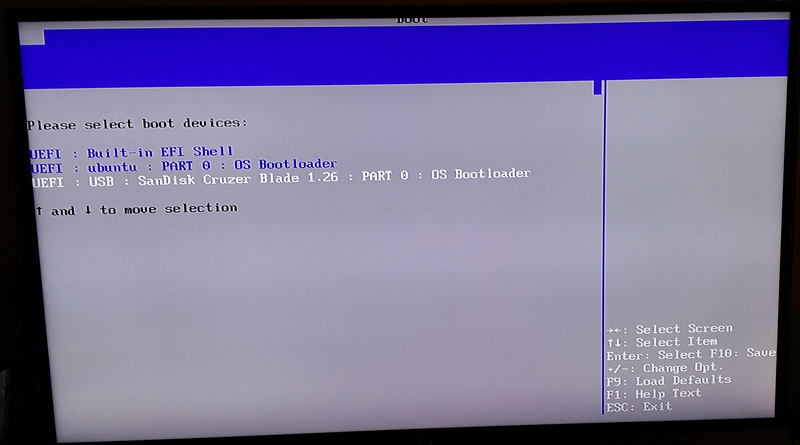 To be able to boot from the USB stick with ExTiX you have to make two changes in the BIOS of the Compute Stick. Connect a keyboard first. (Your wireless keyboard won’t work in BIOS). Start up your Compute Stick and press F2. Change boot priority from Windows to Ubuntu like this. 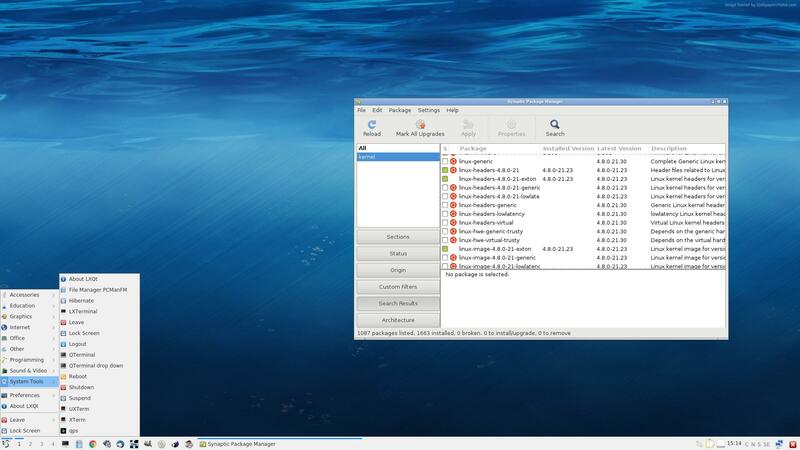 Then restart and press F10 to choose your USB stick with ExTiX on. It can look like this. Perhaps the screen resolution won’t be optimal. If you can’t reach the menu you can right click on the desktop and create a new folder. 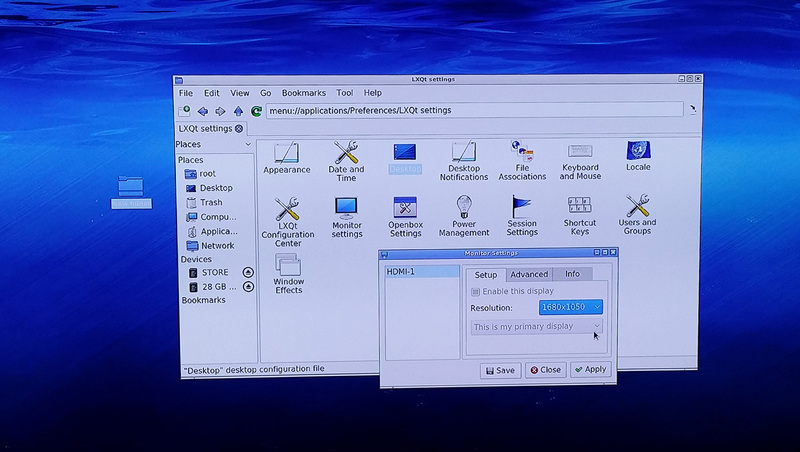 Then go to Applications >> Preferences >> LXQt Settings >> Monitor Settings and change to the resolution you want. 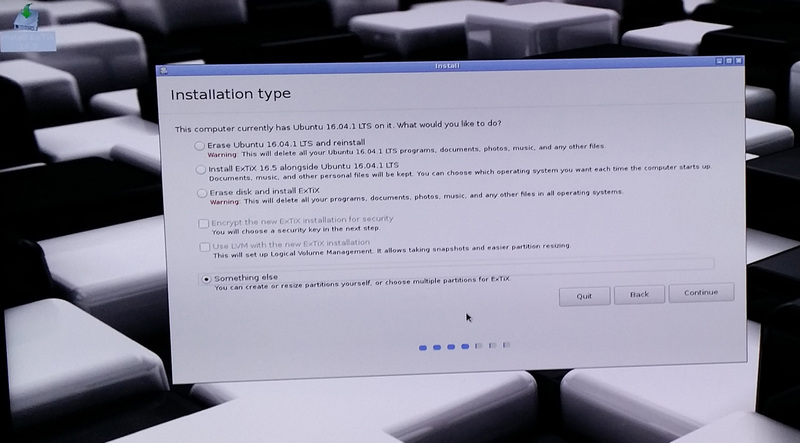 Just start the install program Ubiquity from the menu (Install ExTiX 16.5). Or click on the Desktop icon Install ExTiX 16.5 when logged in as the ordinary user extix. Then just follow the instructions. When asked where/how you want to install ExTiX it will look like this. Choose to install Grub in MBR. If Ubiquity crashes during the installation you should run the following commands and start all over again. If Ubiquity stalls in the end of the installation you can just close the installation window. The installation is ready. If not just start all over again. Note: Build 161203 won’t crash. Occasionally crashes of Ubiquity when running the previous version of ExTiX (from161119) was the main reason for the new release. I.e. in Build 161203 Ubiquity (and everything else) will work as expected. Grub is installed in Ubuntu 16.04. This is how /boot/grub/grub.cfg looks now in relevant parts. Did something go wrong? GRUB doesn’t show up? 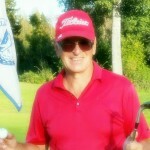 Here is a tip, which I learned from Liliputing.com. Before you run the command sudo update-grub you should edit /boot/grub/grub.cfg or (preferably) /etc/grub.d/40_custom to your liking. There are many different Intel Compute Sticks around as you can see here. One has 4GB RAM and three USB 3.0 ports, but it costs $485!!!? 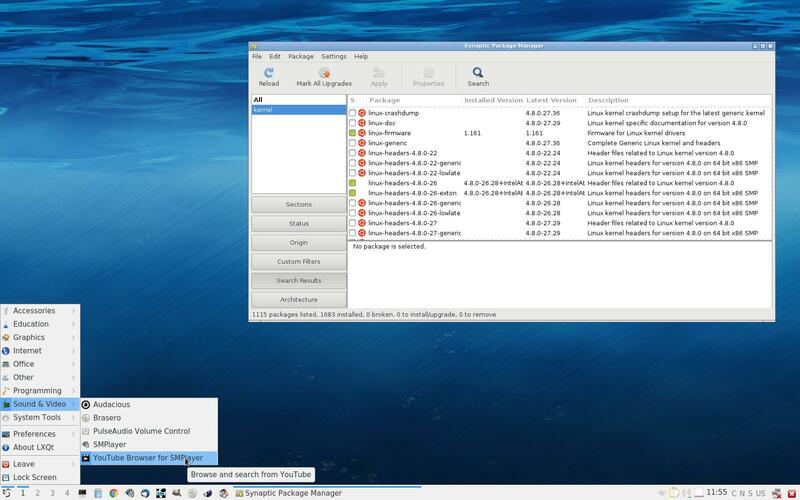 ExTiX uses NetworkManager. When you are logged in to LXQt it will pop up a window saying that there are networks you can connect to. Just choose yours, give your WEP/WAP password and connect! 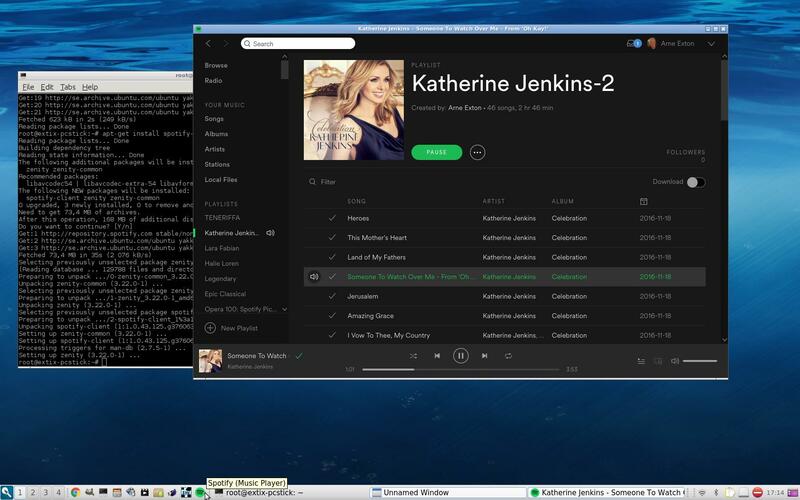 You can (of course) run Spotify in ExTiX. Just install Spotify with sudo apt-get install spotify-client. If it doesn’t work follow this instruction. You can watch HBO movies in ExTiX on the Intel Compute Stick. Follow this instruction. 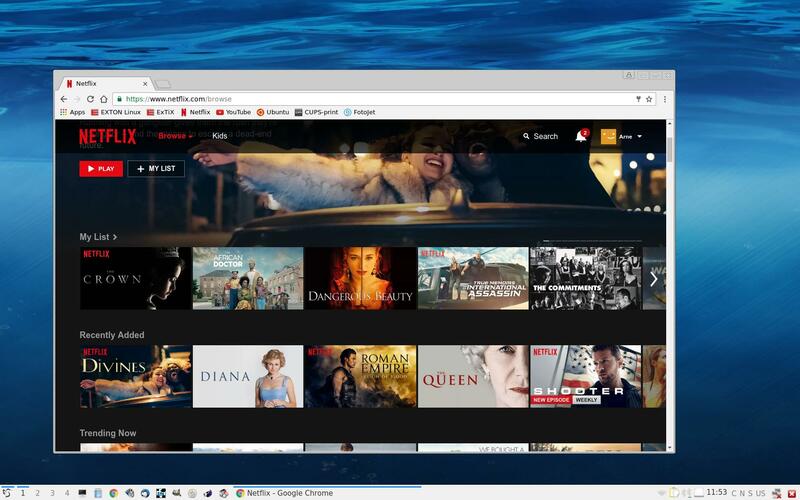 HBO works unfortunately only with Firefox. If you install ExTiX to your SD card you must/should immediately (for security reasons) manually change root’s password. This is because the installation program does not ask about a new root password. (Ubuntu original uses no root password). The root password is changed by running the command sudo passwd root. After installing ExTiX to hard drive, you can alternatively remove the root password altogether. 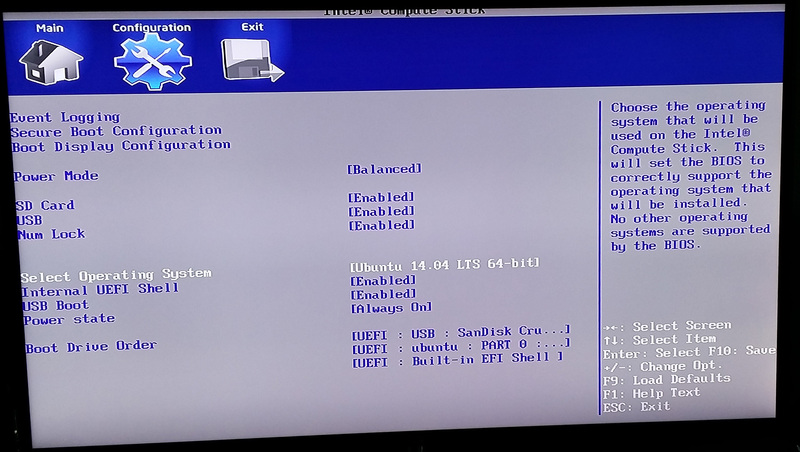 This is done with the command sudo passwd root -l.
If you need more information about how to install and use Ubuntu on Intel Compute Sticks a lot can be found on Linuxiums different sites. Also on many other sites. 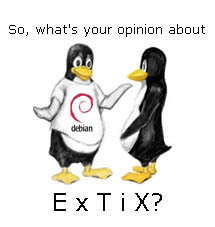 Download ExTiX 16.5 for Intel Compute Sticks from SourceForge.net – Fast, secure and free downloads from the largest Open Source applications and software directory. Could this be run on a laptop having identical hardware to the Intel compute stick? I’ve tried the Linuxium version and it worked great except for the sound. Your version seems to have a newer Linux kernel in it and I’m curious to see if the newer kernel would enable me to use the computer speakers or headphones for the sound output. It’s possible. Please try ExTiX and let me know the result. I tried it and it didn’t boot. I have the secure boot disabled so it can’t be that. I also tried to boot the Linuxium version after that with the same USB stick and it booted with no problems. I then tried to download your version again, formatted the same stick and created a new boot USB stick with Rufus by using the settings as with the Linuxium version but it still refused to boot. 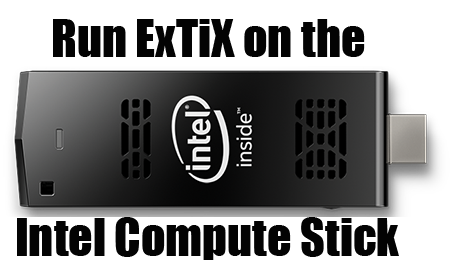 Could you consider making a version that boots on laptops with the same hardware as in the Intel compute stick? It would basicly be just like the version from Linuxium but with the correct sound and bluetooth drivers installed. The battery manager also needs some fixing but other than that it should be good. Using 4.9 kernel, after it first gets officially released, could be a good idea as there might be some patches included for Bay Trail processors. I’m not the only one struggling with this same issue and your effort to make a Linux distro for Bay Trail laptops would be greatly appreciated. That’s strange. I don’t know what the difference is. Maybe it’s a screen matter? Try to boot with “nomodeset”. It will be difficult for me to create such a system since I don’t own a Lenovo Ideapad 100S-11IBY or a similar laptop.